← SEGWAY CURITIBA: Experience Curitiba in an innovative and fun way! This article was first published at the The Travel Word, who have agreed to its republication here. View the original article on The Travel Word. Curitiba, the capital of the Brazilian state of Paraná, is the biggest city in Southern Brazil. It has the country’s eighth largest urban population, approximately 3.2 million people spread across 26 municipalities. It is also an important cultural, political and economic centre in Brazil. Despite its size, Curitiba is considered by some people to be an ‘unknown’ destination, especially when compared to São Paulo, Rio de Janeiro, Salvador and other cities in Northeast Brazil. What most travellers do not even imagine is the exuberant flora and fauna found in the city and its surrounding areas, especially the wonderful islands on Paraná’s coastline. Curitiba is located in an ‘ombrophilous mixed forest’ area also known as Araucaria moist forest, a sub-type of the Mata Atlântica or Atlantic Forest. The city is therefore fittingly famous for its green areas, like the Botanical Gardens and three greenhouses used for the annual production of native and exotic tree species, fruit plants and flower seedlings. Elsewhere there are thick populations of purple and yellow ipês (tabebuia) and Paraná or Brazilian pine (Araucaria angustifolia). To reach Paraná’s coast from Curitiba, you can go by car or take one of the most exciting train tours in the world across the Serra do Mar, one of the best-preserved Brazilian Atlantic Rainforest areas. Once you arrive in Morretes or Paranaguá, two historical and colonial towns located on the Paraná coast, you aren’t far from amazing landscapes, rich animal and vegetation biodiversity, spectacular bends, canyons, gorges, waterfalls and a lot more. You will also find the piers mooringboats to Superagui National Park and Ilha do Mel State Park and Ecological Station. Both are gorgeous islands offering up-close contact with the environment of the region, each of them with its own characteristics and peculiarities. Ilha do Mel is carpeted by the Atlantic Forest and home to two conservation units devoted to preserving the natural environment of the island. The Ecological Station covers approximately 95% of the island, focusing on scientific research and environmental educational. In addition to similar pursuits, the Ilha do Mel State Park is also open to the public for leisure and tourism. The island is a perfect destination for hikers, bikers, surfers, nature lovers and anyone who just wants to relax and enjoy the peaceful atmosphere. Beautiful beaches, rich flora and fauna, mangroves, lagoons, swamps and other interesting attractions such as the Fortress Nossa Senhora dos Prazeres, the Lighthouse Farol das Conchas and Encantadas’s Grotto have turned the paradisiacal isle into one of the most visited places in Southern Brazil. In 1989, environmental activism resulted in the creation of Superagui National Park, 21,400 protected hectares that are considered by the UN as one of the most important coastal ecosystems in the world. The park was also been declared by UNESCO a Biosphere Reserve in 1991 and a World Heritage Site in 1999. Superagui National Park includes Ilha do Superagui and other small islands on Paraná’s coast such as Ilha das Peças, Ilha de Pinheiro, Ilha do Pinheirinho and some contiguous continental areas like the Rio dos Patos and Canal do Varadouro. 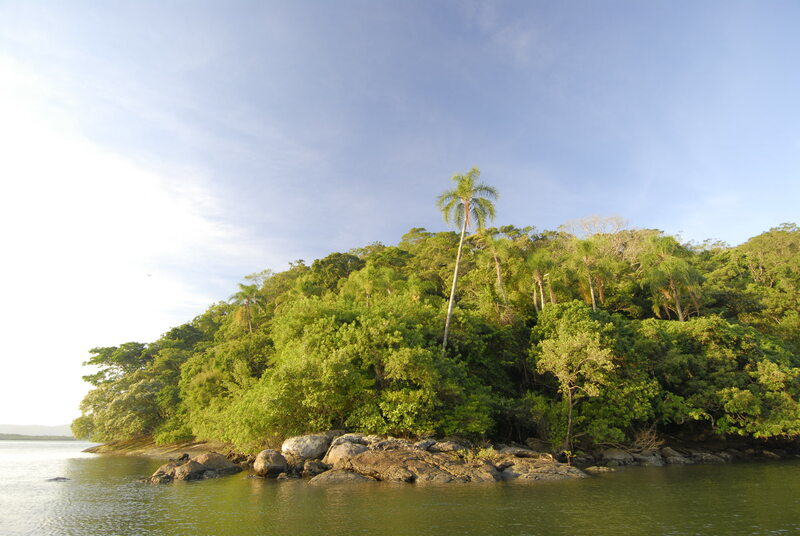 Bays, beaches, mangroves and abundant Atlantic Forest compose the Superagui National Park ecosystem. The park is the natural habitat of a multitude of animal and plant species, some of them rare or endangered, such as the red-tailed Amazon (Amazona brasiliensis), the broad-snouted caiman(Caiman latirostris), the cougar (Felis concolor), the brown howler monkey (Alouatta fusca) and the Superagui lion tamarin (Leontopithecus caissara). This last one is a monkey species only been found on Superagui Island. Agoutis, deers, wild pigs, toucans, marine birds, jararaca and coral venomous snakes, among other animals, can also be found in the region. 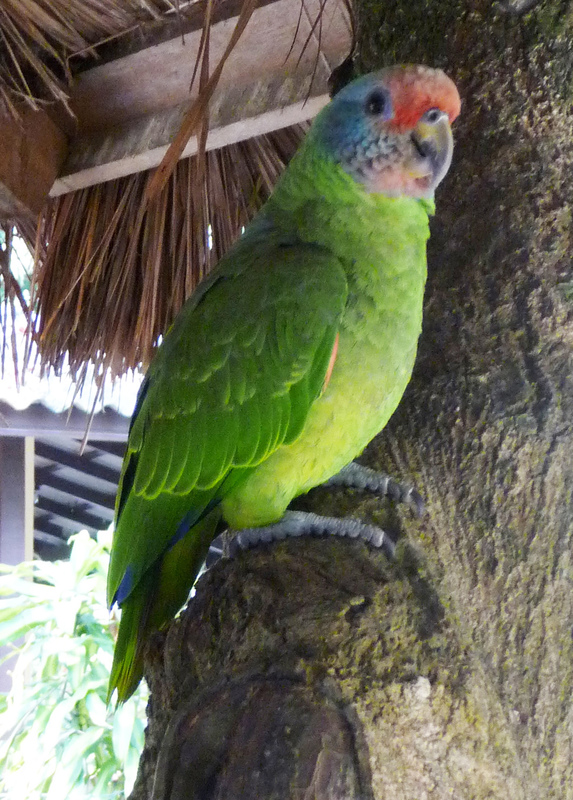 On Ilha do Pinheiro, the roosting habits of the red-tailed Amazons are a strong draw. These endemic birds leave their nests in the morning to fly to the larger islands and then on to the continent, where they spend long daytime hours. They then flock by the hundreds back to the island at the end of the day, a natural spectacle not to be missed. Another appealing animal is seen on the way to the park are dolphins. Wherever you end up, you are close enough to Baía dos Golfinhos (Dolphins Bay) at Ilha das Peças that you could see many groups of them. A dolphin-watching jaunt on Dolphins Bay is certainly a must-do when you go to Ilha do Mel State Park or Superagui National Park. There are also human settlements in the area, like the small fishermen communities on Ilha das Peças and Ilha do Superagui, where they run other businesses, such as pousadas and guesthouses, camping grounds, bars and restaurants. These locals live a life in sync with nature; unlike their counterparts on Ilha do Mel, Superagui locals also have less access to new technologies, which means that traditional costumes and dances, like the fandango(Paraná Coast’s popular dance), are preserved for future generations. Public access to the park is restricted, so you can only visit the communities, the beaches and their immediate surroundings. The greatest land attraction of Superagui National Park is Praia Deserta, a 38-kilometre-long desert beach that can only be appreciated on foot (a four- to seven-hour hike) or by bicycle (rentals are available in the park). 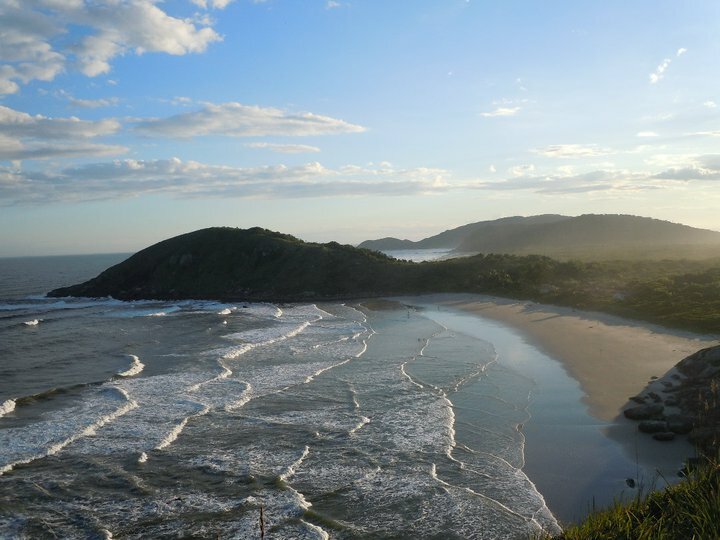 For more about the wild nature, rich fauna and flora of Brazil’s Paraná Coast, contact Special Paraná, your whl.travel local connection in Curitiba and Paraná’s Coast, also an expert on the area’s accommodation, tours, activities and loads of local hints.